Deep breath, Hopscotch typeset pages are gone from my virtual desktop to Picador’s virtual desktop to become a physical printed book by April available in the bookstores. And in e-formats and online too, of course. For better or for worse, the writer has had to make the final decisions on the text and then let it go. This has been the first time I’ve edited page proofs in a live PDF format. It works well for the senior editor (Emma Rafferty) because she can merge all the corrections and changes coming in from the writer (me), copy editor (Bri Collins) and publisher (Alex Craig), although it’s a bit clunky for the writer to use. Selecting text to delete, replace or add is fiddly. But also more accurate. 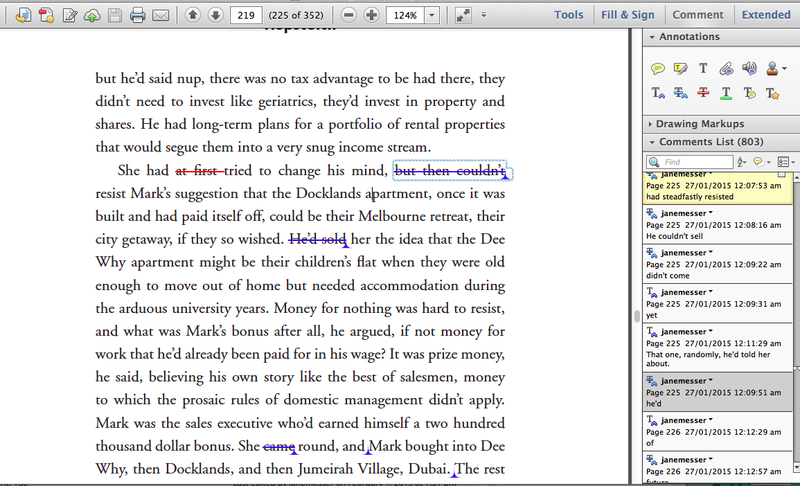 With hardcopy, it can be a challenge to write in the changes and additional text neatly and clearly in the margins. I was always amazed during production with my other books, to see how neat the various editors’ handwriting was, and never managed it myself. Also on the plus side of working from the typeset PDF format, you see the text more or less as it will be in its final print format. Posted in The Writerly Reader blog and tagged book design. Bookmark the permalink.